Are you ready for juicy, just-picked heirloom bliss? There is nothing quite like the satisfying goosh of a fallen tomato exploding under foot. I’m head-deep in Windrose Farm foliage, crouching on my haunches with my trusty Cannon perched toward the heavens. Dirt be damned—I’ve found the perfect cluster of waxy, yellow orbs, and their striking color demands nothing less than a bold “rockstar” angle. HERITAGE FLAVORS : Whether yellow, red, black, or striped, heirloom tomatoes are ready for their close-up at Windrose Farms in Paso Robles. The two day Sept. 20-21 Heirloom Tomato Festival will bring lovers of the juicy veggies together for Brazilian dancing, local chef-prepared bites, and offerings from Chefs Zach Jarrett and Zak Walters of Santa Monica-based Salt's Cure. The celebrities of this dusty shoot are varied and plentiful: blood red, pea green, purple, mauve, inky black, brownish, and even striped like the most showy glass marbles. They are big and small, oblong, rounded, and lumpy. Alas, they are all heirloom tomatoes, and, on this mild Paso Robles morning, I have to admit they really are as intriguing as any human subject. Bill Spencer breaks my tomato trance. Wearing a cowboy hat, he whizzes by on the bicycle he uses to get around the 50-acre organic farm. His wife of more than 20 years, Barbara, is busy with chores and farmworkers on another corner of the fertile land, no doubt processing crops that will soon be transported to discerning restaurants across the county. Notepad at the ready, I head for the farm’s nearby apple orchard, where a canvas tent is already rising above the grass, thanks to local glamping outfitter Whereabout. This is where attendees of Windrose Farm’s annual Heirloom Tomato Festival—set for the weekend of Sept. 20 and 21—can hang in hip, bohemian style between dribble-inducing bites of the red-hot summer veggies. Flanked by branches heavy with sweet, Red Gold apples, I find farmer Bill helping Whereabout owner Vanessa Amerson pitch a Civil War-era tent that could comfortably fit five people standing straight up. Each tent comes complete with beds, woven rugs, and cute accoutrements. Amerson partnered with FARMstead ED, purveyor of hands-on agricultural experiences, to bring the glamour-plus-camping experience to this year’s festivities. After 24 years tending this land, the Spencers are used to accommodating guests at Windrose Farm: Everyone from fancy Los Angeles restaurateurs to winemakers and family friends want to experience the majestic hillsides and lush crops—not to mention the colorful chickens and flocks of fluffy, white lambs that roam the place. When the couple remodeled their on-site farm stand, they wisely installed a washer, dryer, and shower. Like any self-respecting farmer, Spencer’s talk tends to circle back to his favorite topics: water conservation, what’s ripe, and the almighty weather. “Did you see the eggplant crop mulched with lamb’s wool?” He asked, pointing to the rows of dark purple and green a few yards from the tent. Indeed, I had noticed, even stooping down to touch the wiry white clouds encircling each plant (an all-natural defense against early morning lows). Beyond that, I could see vivid rows of peppers, many of which will be smoked in the Spencers’ smokehouse. The farm boasts a dozen vegetable rotations, six in apples and stone fruit, and five in sheep pasture. The rest, as the Spencers are known to say, is helpful habitat—full of animal, bird, and insect life. The celebration of all things heirloom tomato kicks off Saturday, Sept. 20 with a 50-person farm tour, dancing to Brazilian band Chorro de Ouro, whole Windrose Farm-sourced smoked lamb, and multi-course supper featuring Chefs Zach Jarrett and Zak Walters of Santa Monica-based Salt’s Cure alongside Eat Your Drink cocktail chef Matthew Biancaniello. On Sunday, about 200 ticket-holders will dive into a grand tasting of more than 40 heirloom tomato varieties, local chef-prepared bites, beer, herbal concoctions, and wine. Proceeds from an art sale will benefit the Paso Robles Youth Arts Foundation (PRYAF). All the action is set to take place on the Spencers’ springy front lawn, complete with a 250-year-old oak tree centerpiece. The participating area chefs, which include Greg Holt of Big Sky Café, Chris Kobayashi of Artisan, and folks from FIG Good Food, Apple Farm, and Templeton Hills Beef (among others) will unleash their favorite heirloom recipes bolstered by even more Windrose Farms produce. The heritage tomato varieties are beloved far and wide for their pure, concentrated, and diverse flavors. Whether sourced from Talley Farms, SLO Veg, or a cramped patio garden with just enough light, my most fervent heirloom-loving friends love to eat them in as many ways as possible. We’re talking with a bit of salt and pepper, plopped into fresh Greek salads, and sprinkled into pasta with sautéed garlic, basil, and olive oil. Me? I love them baked onto mozzarella-laden crostini with a drizzle of balsamic vinegar. For those too scared to ask, I did: What actually makes a tomato “heirloom” quality? CAMP OUT : SLO-based glamping outfitter Whereabout has partnered with FARMstead ED and Windrose Farms to present bohemian-style camping during the farm’s annual Heirloom Tomato Fest slated for Sept 20-21 in Paso Robles. 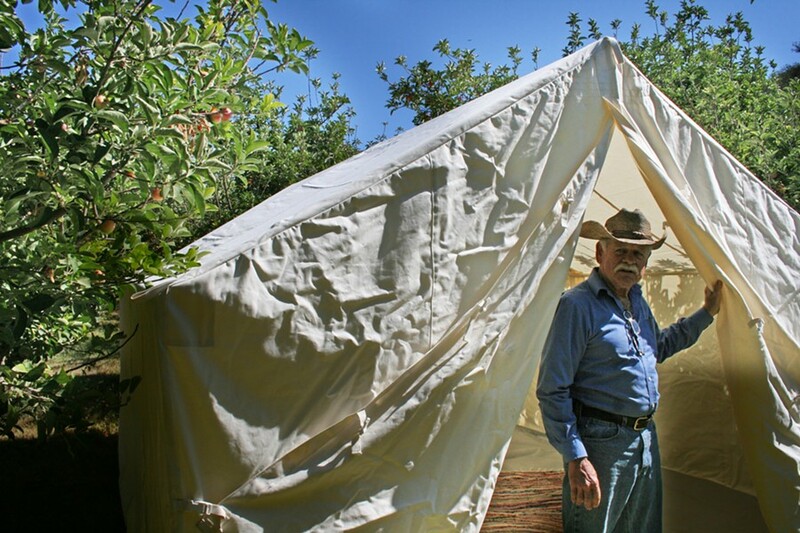 Pictured, Windrose Farm owner Bill Spencer checks out the canvas tent in the days leading up to the celebration of all things big, red, and juicy. Unlike hybrids, which don’t produce an identical variety from a saved seed, open pollination in heirlooms allows the veggies to come true from seeds each year, thus preserving their unique characteristics. Many of Windrose Farm’s seeds are saved by the Spencers themselves, through a smelly process that occurs each fall (squish a really great tomato, remove some seeds, mix with a bit of water, wait a few days, stir occasionally, then rinse and dry them off completely). 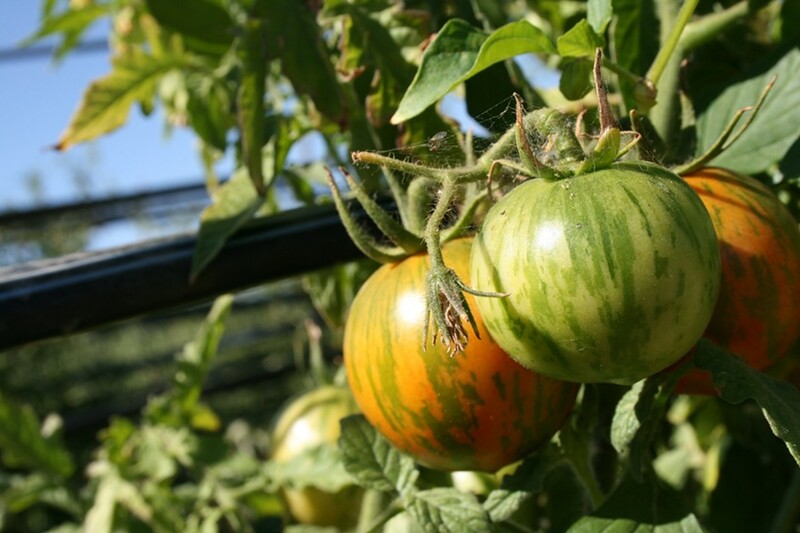 A bevy of interesting heirlooms will be there for the chomping during the festival: Black heirloom tomatoes, like the Black Crim, originate from the Crimea area and boast a strong, earthy flavor. A small, reddish variety known as the Cosmonaut Volkov, matures in just 50 days. Luckily for Bill and Barbara Spencer—and the heirloom lovers who love the couple—the weather in Paso Robles isn’t quite so nippy. In fact, tomatoes came early this year, as did the peaches. Tickets to the Windrose Farm Heirloom Tomato Fest are $35 to $180 per person depending on the package and can be purchased at FARMsteadED.com. For more information and reservations for apple orchard camping before, during, and after the event, visit whereabout-slo.com. The Spencers’ on-site farmstand is open to the public, selling farm fresh, seasonal produce just a stone’s throw away from where it was plucked from the Earth. Give the farm a ring and they’ll even be so kind as to assemble your order ready for pick-up (call 239-3757 or check out windrosefarm.com). The farm is located at 5760 El Pharo Drive in Paso Robles.